Ashcombe Gardens Journal - EXMOOR 1820 ... THE YEAR OF CHANGE. Many thanks to Rob Wilson-North for his words describing the past, present and future of Ashcombe Gardens. Why are Ashcombe Gardens Important? Ashcombe Gardens are an example of a nationally rare garden phenonmenon, and although uncompleted (and therefore fiendish to disentangle and work out), are worthy of better recognition. Within the context of Exmoor and Simonsbath they could provide a place in which visitors can enter the story of the Knight family and Exmoor and better understand the concept of National Parks and what they stand for. The restoration – perhaps not quite the right word for something that was never completed – will gently reveal and enhance the physical remains of the garden: the paths, bridges and outcrops, and sensitively add in a planting scheme that reflects what may have been there. They will also reunite White Rock Cottage and the buildings around it with the garden landscape, of which it forms an integral part. We are on a journey, treading carefully and not rushing, a process that will gently re-awaken what was meant to be a Knightian paradise, gardens at the centre of a 16,000 acre estate set in the middle of Exmoor – a jewel in the Moorland crown. Ashcombe Gardens seem to have been laid out by John Knight to Picturesque principles. However, no documents have been found that relate to them and there are no plans or drawings of what was intended. Our understanding of them is derived from detailed study of the physical remains. Like all gardens they have evolved: in 1837 John Knight left Exmoor and his busy son Frederick carried on trying to make the Exmoor estate profitable. On his death in 1897 the Fortescue family moved briefly to live in Simonsbath in 1930's and the gardens were planted up. In the 1940’s the garden landscape in Ashcombe was clear felled and most of the trees removed. Since then it has been reverted to a mix of oak, ash and sycamore mainly. Today the remains of the gardens reflect their original layout which we assume was begun in or just after 1820 to provide an appropriate setting for the mansion built in Simonsbath. What is a Picturesque Landscape? 'In the 18th century, there was a fashion for manicured landscapes, represented best by the works of 'Capability' Brown. These were relatively naturalistic compared to what had preceded them. However, as time progressed there was an increasing move towards garden landscapes that took their cue much more from natural elements, and there was criticism of the contrived nature of Brownian landscapes with their shaved grassland, rounded hill forms and little clumps of trees. To describe this phenomenon – which was effectively a greater appreciation of the beauty in natural forms and native species – the term Picturesque, Sublime and Romantic are used at various times in the later 18th century, with their precise meanings changing over time. We also must acknowledge that what they describe is highly subjective. All of this makes accurate classification of these garden landscapes today quite difficult. However, the proponents of the Picturesque and the almost contemporary works of the Romantic Poets, laid the foundation, in terms of thinking, that led ultimately to the National Parks Movement and the design of Exmoor as a National Park in 1954. In the midst of these Picturesque concepts – and key proponents of them – are members of the Knight family: Richard Payne Knight who created the Picturesque landscape at Downton Castle and was a key protagonist of the entire concept and Thomas Johnes who created the Pictureque landscape at Hafod. Both men were second cousins of our John Knight. John’s aunt Mary lived at Hestercombe, married to the creator of the Picturesque landscape there, Coplestone Warre Bampfyled. As Michael Symes, an authority on these types of landscapes acknowledges, the Picturesque was in the Knight family genes! However, Simonsbath has not yet taken its place amongst those great garden landscapes. The Picturesque conforms to key principles. Perhaps underlying it all is that it takes its cue from nature. However, it is more subtle than that, because nature can nearly always be improved upon! The term itself – Picturesque – is used because the gardens are effectively a series of ‘pictures’. The garden is a journey around the landscape and at certain points the visitor is brought to a specific point to experience (see/hear/smell/sense) a special view or effect. These can be gentle or overwhelming (such as giddy precipice). The Picturesque is about contrast, surprise, textures (rough and smooth) and so on. Underpinnig this is the use of mainly native plants and trees, used artfully. Also used are ‘rockwork’ in the form of stones, boulders and outcrops. Rusticity is valued highly and local materials are used in any structures. People place an energy, scale or presence in such landscapes, so that a wooded combe may have a simple hut, a river an old mill or a hill a ruin. Ashcombe conforms to all of these principles, despite being built at a time when the Picturesque was almost out of fashion (is that because John Knight, at 53, had never really had control of his own estate and wanted to create what he knew best?). The Ashcombe Gardens Volunteers and the work they are doing with ENPA. 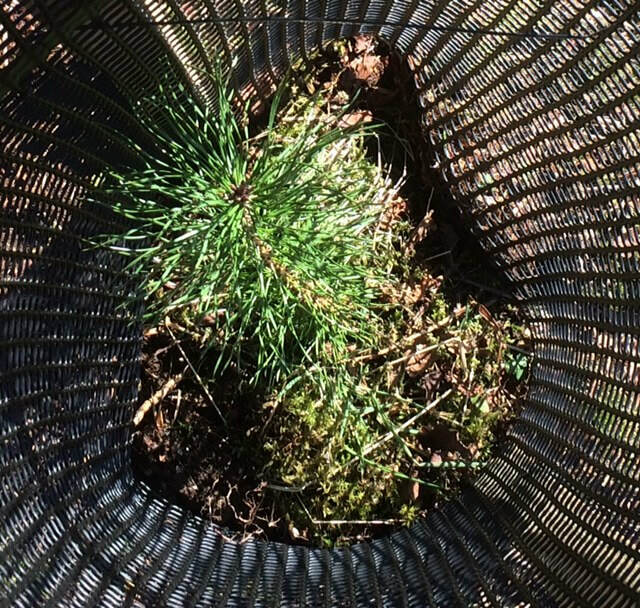 Volunteer Gardener Days began in March 2019 with Snowdrop and tree planting. The volunteers will be at Ashcombe gardens on the first Monday of every month with an array of jobs; planting, tidying and cleaning the White Rocks of Ashcombe to name but a few. Each day's events will be recorded here with the most recent entry at the top. The day started with a briefing and those who wanted to make a start in cleaning the white rocks were given a very special tool – a tooth brush – well, it was April Fools Day! Armed with something more substantial than a tooth brush, several volunteers were very keen to expose the rocks in all their glory. Another team of volunteers cleared the wall, near the stream and car park, of all its brambles and rotten wood. We wanted to expose the wall as it is a wonderful feature with in the garden but it was like a wall in Sleeping Beauty’s garden, you could not see it for growth. If you now visit the Ashcombe Gardens you will be so impressed by the work that has been done. The Rocks and the Wall are now telling their story and they are shouting it loud and clear. It was such a beautiful day that all the volunteers had lunch sat together on the grass, without coats on, in the fabulous sunshine. This was an extra day, a bonus day, due to something very special happening of which I have to keep secret for a couple more weeks! Look out for it in a later blog. So what I can tell you is that 12 volunteers turned up at 10.30am to plant up an area near the Ashcombe Stream next to the meadow. This is a boogy waterlogged area and so it was agreed to plant Flag Iris, Meadow sweet and Ragged Robin. These three plants are native and are found on Exmoor but don't seem to have settled in Ashcombe. We are hoping that with some careful management they will thrive. The Meadow sweet and Ragged Robin will naturally seed themselves and the Flag Iris will form clumps which can be lifted and divided as they grow. 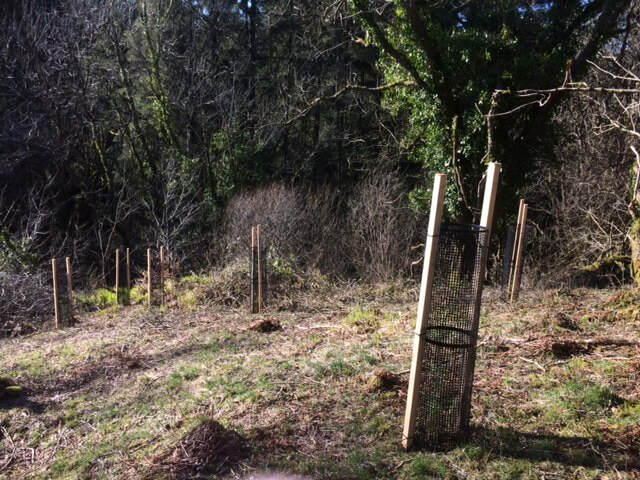 They had arrived as very tiny plug plants and so while a few volunteers put themselves forward to assist with the 'Secret Mission' the rest, guided by Patrick Watts-Mabbot and Jackie Kiberd from ENPA, planted up these small beauties. The flag iris will eventually become over 1 metre tall but they went in today with only a height of 4 cm. We are hoping that people will not walk all over them too much, but plants are pretty resilient and have to put up with all sorts to survive and it will be amazing to see them reach their full height and colour in the summer. Once this job was completed they then went a made a clearing in the upper area which will possibly one day become an orchard. After a lunch and chatting about future tasks it was decided to end the session. The volunteers are working well together and forming a really good group of people who have a keen interest in helping the gardens develop. After an amazing week of weather the volunteers were greeted by torrential rain, hail and thankfully some dry moments too. This did not deter the 20 people who had turned out to start bringing back John Knights vision. After a quick cuppa and a briefing by Rob Wilson-North and Patrick Watts-Mabbott, it was off to start work. The majority joined Charlotte Hornsby in planting 1350 snowdrops on the East side beyond the white rock outcrop. The rest joined Graeme McVittie and planted very young trees in an area now lovingly known as the Swamp. These included, Portuguese Laurel, English Yew, Swamp Cypress, Scots Pine and various willows including Purple Willow and rather aptly named for the area, Swamp Cypress. There was also planting of Yew and Box above the swamp area on the west side. BBC Radio Somerset and Exmoor Radio both arrived during the morning and interviewed several members of the group to discover more about the project. After lunch the team carried on with the last of the tree planting, pruning willows near the stream and taking all the woody material up to an area for a bonfire for later in the year. ​The volunteers were excellent throughout the whole day and were all really keen to get stuck in, even if the weather was not that pleasant at times. All of the work planned for the day was completed in a much quicker time than was expected which was fantastic. The April volunteer day will be cleaning the quartz, and tidying the pathways plus any other pruning that is required. Most had finished by 2.30pm and so it was decided to end there. 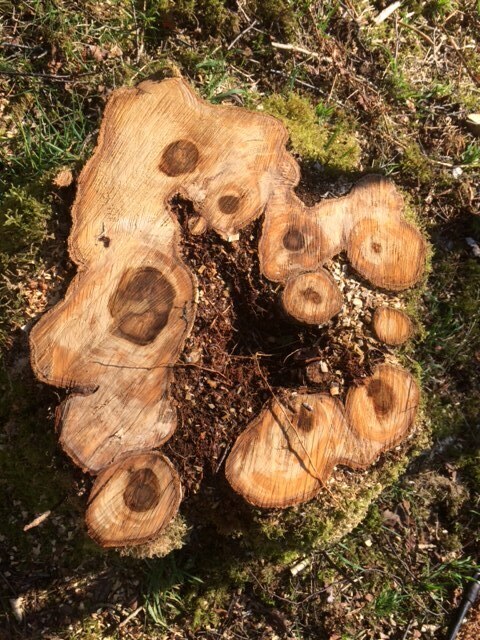 New Scots Pine and remains of old tree stumps.